Whatever aspect of your riding you want to improve one to one private lessons are the quickest way for you to learn and to progress. 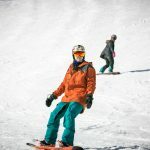 From complete beginner looking to learn the basics of snowboarding to advanced riders who want to polish up their technique or focus on a specific aspect of their riding, individual one to one private lessons allow you to dictate the pace and content of your lessons. Whether you are a complete beginner or an advanced snowboarder you will see significant developments in your riding throughout the week on one of our technical camps and courses. Our Technical camps and courses are run throughout the winter season and are a great way to meet people, make new friends and develop your snowboarding. If you are not sure if this is for you then why not give us a call or send us an email and we can discuss what will work for you. Freestyle Lesson, Course or Camp? Progressing your freestyle riding never stops! From a 2 hr lesson to focus on specific tricks through to a full week of coaching, our instructors will work with you to advance all aspects of your Freestyle riding. Avoriaz is considered a hub of European snowboarding and has 5 snowparks including the Burton Stash and a superpipe. There are a further 8 parks across the rest of the Portes du Soleil. At MINT Snowboarding we have been teaching kids aged from 3 years old to snowboard for over 12 years. We aim to create a fun and engaging environment for your kids to learn to snowboard. From complete beginner to fully fledged little ripper, our private and group lessons are the perfect way for you kids to learn to ride. If you want to get off-piste and hike or splitboard tour into the backcountry to ride epic powder lines then you should be riding with us. We have a huge choice of backcountry off-piste adventures in the Portes Du Soleil, the Grande Massif and Chamonix for you to choose from. MINT Snowboarding since 2006. World Snow Award Winners in 2016 & 2017! Whether you’re year round residents or seasonaires living locally around Morzine, Les Gets, Avoriaz and Chatel we have specific snowboard lessons to get you learning and progressing this winter. To help you take your riding to the next level we are offering group courses at significantly reduced rates to all locals this winter. Whatever level of snowboarder you are from complete beginner to advanced rider we have something for you. *Block must be booked & paid for at the same time. If you are looking to head off-piste this winter you need to get avalanche Savvy!!! Learn how to use your transceiver for search and rescue and how to assess avalanche risks, this session is run by our IFMGA Mountain Guide David Gladwin and is open to skiers and snowboarders – Have a read of one of David’s articles – ‘Staying safe just off-piste’. Further dates can be added upon request and subject to availability. Up your freestyle game this winter with some early season sessions to get your freestyle technique dialled. We are running a series of sessions developed as a follow on from each other to progress your freestyle riding. Freestyle sessions are open to intermediate/advanced riders (must be able to link turns), we are also running girls only freestyle sessions. Beginner & Improver Riders: Build on your basic riding skills and gain confidence to tackle steeper and more difficult runs. Intermediate & Advanced Riders: If you’ve had little or no formal coaching this session will teach you techniques such as torsional flex and pedalling which will progress all areas of your riding. Which resort are you staying in? How did you hear about MINT Snowboarding? I’ve been snowboarding a couple of years but after a fall I’d lost confidence on a board, after a 2 hour lesson with Tammy I got that confidence back and found my love for snowboarding again; she’s an absolute legend an amazing instructor I have been singing Tammy’s praises to everyone……I will be back in Morzine next season and I will be booking Tammy for private lessons again 5* instructor and absolute legend!!! Thank you so much!!! I can’t recommend the Technical Performance Course highly enough. I have been riding for 15 years and the skills I learned during this week have moved me on further than I could have hoped. From the initial booking, Tammy and her team were great and helped with everything. On the course Toni our instructor was patient and encouraging and helped whenever it was needed which made the trip fun and exciting. The other people on the course were great and we all got along really well which made for a great trip, I would highly recommend to anyone whatever your ability! Me and a couple of mates had a private lesson with Toni. We can all board but wanted to progress. I have had experience of a number of instructors in France and Switzerland but Toni was by a mile the best. Why? He was fun, but firm and kept us safe. He gave us all time and rather than ‘focus’ on our weaknesses, looked at the positives and helped us to build on those. We’ve given up on being professional (!) and our goal is not to be technically brilliant but to have a bit of fun and ‘try’ new things. Toni tuned into that straight away and from start to finish, we all got something valuable and memorable. In just 5 hours, we ‘mastered’ the ‘dark arts’ of switch, freestyle, the parks (safely!) – we cracked ‘the green’ and were lucky enough to get a real good go at some powder off piste. We loved it and would highly recommend MINT and especially Toni. I was quite scared to even start, but he was very calm and patient. He was encouraging and always there. Really, you have amazing instructors… Be proud of him! My instructor, François, was excellent from start to finish. With around 22 years of Snowboarding experience, 14 of which coaching, he really understood the mechanics of snow boarding and was able to communicate them. He kept it fun and was very up beat. But most important of all he cared about our group getting better and did everything he could to ensure we did. Our instructor Laura was excellent, she rebuilt my wife’s confidence after an incident that made her decide that she was never getting on a snowboard again. Laura was extremely patient and made the lesson a fantastic experience for both of us, I received some pointers to improve my techniques and my wife life left with tears of joy and happiness rather than the tears of fear from 2 days previously. Will be booking some more lessons next year! Please mention a few suitable times for a callback within our business hours.